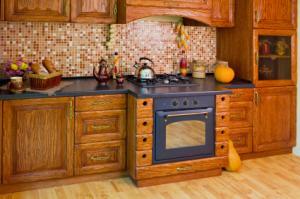 The backsplash is the most decorative area in your kitchen design. It can be made of any material and can be installed in any pattern. If you've discovered a tile you'd love to use on your backsplash, but don't know what to do with it, try one of these backsplash tile patterns. If you've been shopping for a backsplash tile, or just considering adding a backsplash to your kitchen, you probably know that any type of tile is suitable for use on your backsplash. This can make the selection process seem more difficult than it actually is, since choosing one tile out of thousands may seem daunting. Do you want a lot of pattern and detail, or subtle design? 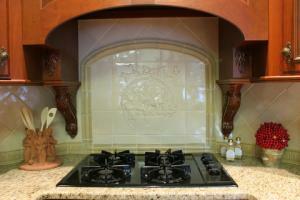 Do you want one, two or multiple colors in the backsplash? What is the style of the kitchen thus far? Is it Tuscan, contemporary, eclectic? The choices of backsplash pattern are nearly as endless as backsplash tiles themselves. Luckily, once you have your tile or tiles selected, the pattern should follow more easily. Backsplashes are relatively small areas of space, typically measuring just 18-inches in height. For this reason, repetitive patterns tend to work well; too random or chaotic a pattern might overwhelm the space. Mosaic tile patterns that repeat every few tiles work well in backsplashes, if a definitive pattern is desired. Stick to tiles 1-2 inches in size to avoid getting too large for the space. Laid in a herringbone pattern. Popular ways to use a subway tile backsplash include using a running bond along the counters, and a framed herringbone pattern behind the stove, and using a border tile mixed in with the subway tiles, one tile up from the counter. Lay the darker color as a frame around the entire area. Use the dark tile as bullnose at the edges, just above the counter and below the cabinets. Fill the space in the middle in with the lighter colors. Shape can differ between the two tiles as well, with the dark tile taking on a rectangular shape to frame a square tile in the middle. Repeat this behind the cooktop, but switch the pattern of the lighter tile to the diagonal for additional detail. Art tiles are defined as any tile crafted by an artisan. Today's choices include three-dimensional tiles in architectural designs that piece together to form complex patterns. Use these in contemporary, urban kitchens in a solid, light color to display the use of shadow and light. The backsplash measures 18-inches in height, while most tiles measure 1, 2, 3, 4 or 6-inches in height. This makes the backsplash a great place to layer tiles of different size or pattern on top of one another. Keep the color palette similar throughout the layers, and mix circles, with thin rectangles, squares and abstract shapes. Keep the most active band to the center and use it by itself behind the range to quiet the design. Mosaic tiles that interlock to form larger circles within a pattern. 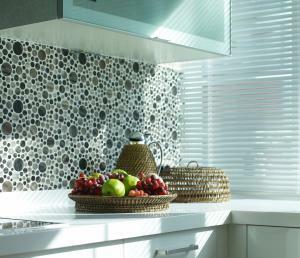 Circles can also be mixed with square and rectangular tiles to form your own twist on a Frank Lloyd Wright styled backsplash. Hand painted and hand carved tiles can be used to create any number of different layouts and patterns for your backsplash. 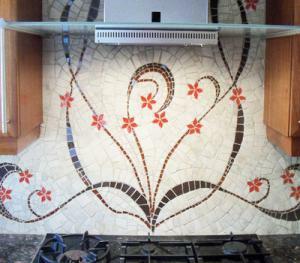 While the most popular option is to install a mural made of mosaics or painted tiles behind the cooktop, it is also possible to use decorative tiles to create a unique backsplash that covers the entire counter area. Look for tiles that piece together to form flowers and create your own garden or tiles that form grape vines, and include a mural of some wine bottles. Decorative tiles can be used in endless ways to either create simple or elaborate patterns of any kind. A step pattern is a two-piece tile pattern that is typically installed on the floor. A smaller tile sits on the corner of a larger tile to form a "step." This pattern also works well on backsplashes, if the tiles are small enough. Consider combining a 3-inch stone tile with a 1-inch glass mosaic step. You might also use two colors and sizes of a ceramic tile. This pattern can be used throughout the entire backsplash, or used only behind the cooktop for a focal point. Sometimes the simplest patterns are also the most striking. 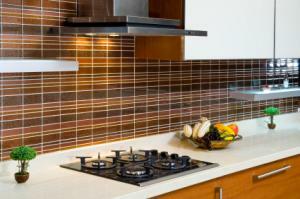 A pattern made of rectangular and square tiles can be done in any material, including glass, stone or ceramic. Select a square tile of 4-inches, and a rectangular tile that is half its size, such as 2x4 inches. Stack two rectangular tiles on top of one another and place them next to a square tile and repeat. You can also vary the design by standing the rectangular tiles on end. The subtly shifting pattern helps to bring interest to the space. Another option is to choose one shape and size of tile, and order it in a rainbow of colors and finishes. Quarry pavers can be used in this way to create a unique arts and crafts style design by mixing glazed and unglazed tiles in a random pattern. Spice up the design by using the same series of colors in a unique shape, such as a 3-inch hexagon behind the range. Backsplashes can be installed in a number of different areas in the kitchen, although some areas are more frequently utilized than others. 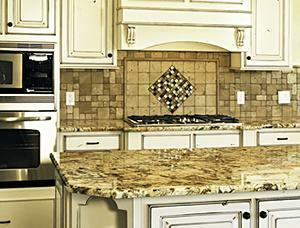 The most traditional backsplash is the 4 inch high variety. This single row of tiles sits right on the counter and helps provide a little protection to the wall. 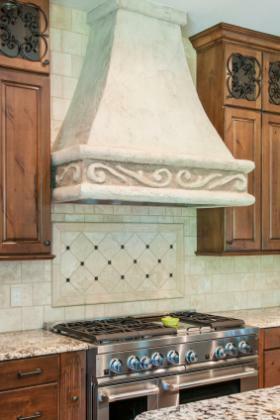 It runs the entire length of the counter, and can flesh out some areas like the wall behind the cooktop for extra protection or a focal point. The areas behind the sink and cooktop are frequently larger than the areas between the counter and the cabinets. These areas also see the most need for protection for splashes and cooking stains. Even if you plan on installing tiles elsewhere in the backsplash, consider installing a focal area in one of these spaces. Frame out the tiles here using a chair rail or pencil tile, and either fill in the area with the field tiles turned in a different direction - straight to diagonal for example - or fill it in with a different material, such as glass mosaics, or with a mural made of hand painted tiles that depict a scene such as a vineyard. 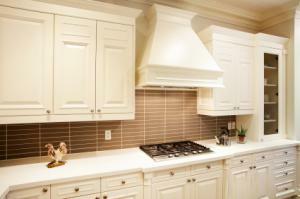 The most frequently tiled area of the backsplash is the counter to cabinet area. This backsplash extends everywhere there is countertop, so if the cabinets end, but the counter keeps going, the backsplash does to. A simple rail molding or bullnose tile can help to finish the ends of the tiles where the cabinets are not covering them. Tiling this area can coincide with tiling a focal point behind the cooktop or sink. Backsplash tile patterns should take their cues from the tiles themselves, the size of the space and the style of the kitchen. Let these elements take control, and your backsplash will become an integral part of the kitchen design in no time.